The ability to focus is becoming an ever rarer skillset in the modern world. Distractions abound and not all of us are good at dealing with them. Many of us have even become attracted to distracted. Whole books and markets have sprung up to deal with this problem. Never have we faced such an influx of busy in our lives. Never have we had to deal with so many external requests and demands on our time. We can literally be reached 24 hours a day, every day if we don’t take the time to disconnect. It has led to an always on culture and expectation. Technology that was meant to help can just become part of the problem, as we misuse and abuse it. The truth is, we can break this cycle. We can instill simple but powerful habits ourselves without needing to break the bank on the latest productivity app/course/Guru think tank. Simple doesn’t necessarily mean easy of course. One example of such a habit is returning to the power of one. One is singular. As in single task. As in one project at a time. As in one conversation at a time. The ability to focus, to dig deep will lead to our most meaningful work and breakthroughs. Why then are we so quick to give up this singular focus to random acts of variety? We flit from this to that, trying to give everything our attention but losing the battle along the way. We rush to get more and more done but end up chasing our tail or buried under endless busywork. We sure are busy, but what is really getting done? We end up spreading our effort wide but rarely deep. What if we focused on less? What if we focused completely on what and who is in front of us, instead of thinking ahead? What if we quit the multi-tasking and single-tasked instead? What if we left the plate spinning to someone else? What if we focused on one? Wouldn’t that be less stressful? Wouldn’t that be a much more pleasant and effective use of our time? Of course, we all need to switch our point of focus from time to time but many of us have totally lost touch with our ability to focus for any reasonable amount of time at all. Even 15 minutes on one task can be a challenge. The distractions are here to stay. In fact, they are likely to increase. We have to find a way to navigate this environment and focus anyway. 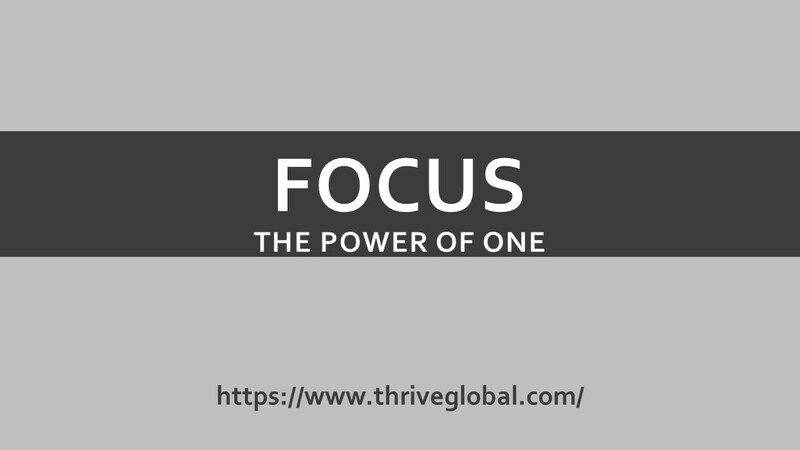 We have to reconnect with our ability to focus purely on one.